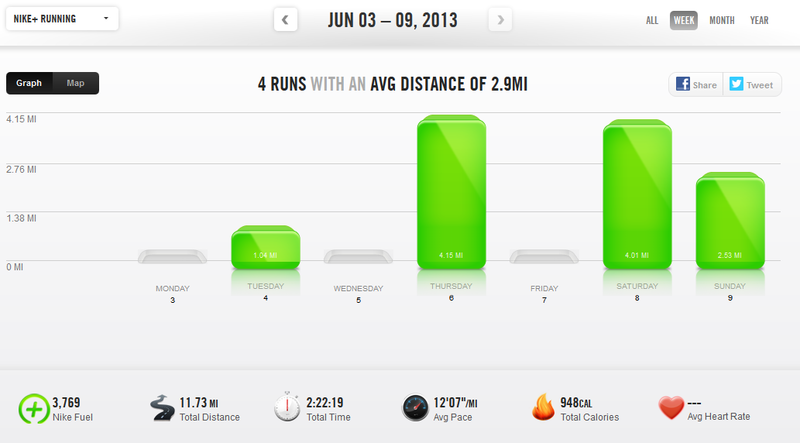 I took Monday off, still feeling the strain in my soleus. However, on Tuesday it felt a bit better, so I went out on a slow one mile run to see how that felt. I could definitely still feel it, but I could tell it was getting better. I still decided to take Wednesday off, so I wouldn’t push it. Thursday morning I headed out to the greenway. I decided to do untimed intervals, running when I felt like it and then walking till I recovered, just to make sure I was going easy and not pushing too hard, especially on hills. I managed to squeak out just over four miles, which made me pretty happy. Later that day, I headed down to Atlanta to see The Postal Service (which was awesome) and went to Six Flags the next day. Obviously, I didn’t get any running in, but I think all the walking really stretched my legs out nicely. Since I’m running a 10k in less than a month (!! ), I was a little worried that my week off had set me back on Couch to 10k. I decided on Saturday to do the first day of week 9. Normally, this consists of four intervals of 10 minutes running with a minute of walking recovery in between. I could still mildly feel my strain, so I lengthened the walking bits to 2-3 minutes each. However, I did complete all four repetitions of running without issue (besides being completely sore and exhausted afterwards), so yay! Sunday morning I awoke to a thunderstorm. I waited for a break in the rain, then decided to head out. My warm up mainly consisted of looking for my water bottle that my cat Oscar had run off with and hid behind my nightstand the night before. I had decided to do day one of week 8, so 28 minutes of nonstop running. About half a mile in, it started sprinkling, and turned into a full blown rain after a mile. But I pushed through the rain and wind and completed the 28 minutes, running 2.5 miles. It felt great! Oscar promptly ran off with my earbuds when I returned, so I suppose my next warmup will consist of looking for those. My calf seems to be doing a lot better. It’s still a little sore, so I’m being diligent in foam rolling, using the Stick, and wearing my leg compression sleeves to keep it loose. Hopefully I won’t have any more trouble before next month’s 10k! This entry was posted in Weekly Update and tagged couch to 10k, couch to 5k, soleus strain. Bookmark the permalink. ← Happy National Running Day! After the weather we’ve had for my running, I would LOVE some rain 😉 You’ll do great at your 10k! Thanks! Yeah, here it’s either been hot and humid or storming and humid. It’s hard to find the inbetween. Today we have blue skies and a tornado watch, so…who knows.